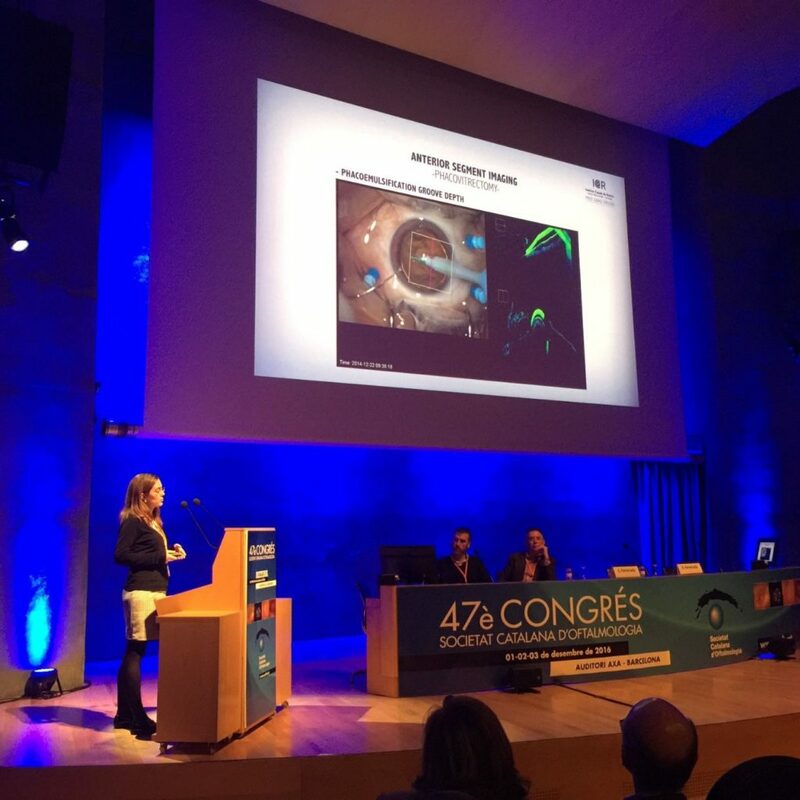 Dr. Amanda Rey, ophthalmologist at ICR Retina Department, has been awarded the prize to the best video communication at the 47th Congress of Catalan Society of Ophthalmology for a video under the name Intraoperative optical coherence tomography in vitreoretinal surgery created in conjunction with Dr. Ignasi Jürgens, medical director at del ICR and Dr. Agnieszka Dyrda, ophthalmologist at ICR Retina Department. During the presentation, several cases of patients who had undergone surgeries for cataracts and retinal diseases (macular hole, epiretinal membrane, retinal detachment, proliferative diabetic retinopathy, myopic macular retinoschisis and intraocular lens luxation) in our center with the use of RESCAN 700, a OCT-guided (optical coherence tomography) intraoperative microscope. OCT is a non-invasive imaging technique that uses light waves to take pictures of the transversal section of the retina, allowing the diagnosis, control, and monitoring of macular diseases at the consulting room. A great advance in retinal surgery has been the use of surgical microscope integrated OCT, as it has allowed to obtain high resolution images from the retina in real time. Dr. Rey, presenting the video communication for which she was awarded the price. Intraoperative images taken by OCT during the retinal surgery provide a quick display of the areas of interest and help us improve and understand the structural alterations in eye tissues during the surgical act, which has a great impact in surgeon decisions. This technology that provides higher safety to surgical procedures was implemented at our center more than two years ago, making ICR one of the the very few clinics in Spain to have it.